The outcomes of criminal cases are often determined by the quality of forensic evidence gathered at the crime scene. Latent fingerprints are one of the best types of evidence to have because, much like DNA, they lead to a specific person or persons who committed the crime. Past techniques to gather latent prints have been crude and produced inconsistent results. Air Science has developed a set of cyanoacrylate fuming chambers that take the guess work out of capturing latent prints on almost any material. Safefume™ cyanoacrylate fuming chambers are designed to safely develop latent fingerprints using ethyl cyanoacrylate (CNA) vapor in a controlled environment for optimum effectiveness and safety where moisture and fuming time are critical factors. The Safefume system controls all functions from start-to-finish, permitting the investigator to initiate an unattended automatic cycle, establish the proper fuming intensity and duration, and to return upon completion to collect results. The tamper resistant compartment helps maintain the chain of custody. The ductless filtration system requires no connection to an outside exhaust system and the automatic control system programs the fuming cycle. Learn more about the benefits of the Safefume by visiting the product page or download a brochure to see the full range of sizes and options available. 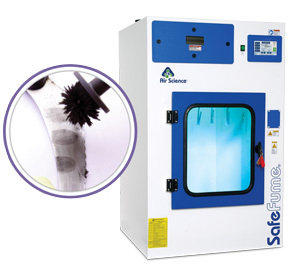 Take the guesswork out of latent fingerprinting with the Safefume Cyanoacrylate Fuming Chamber. For additional information on our forensic products, call, visit our Forensic Application page, or email Air Science today.